This is a true beauty by Ellene Warren . It is one we carried way-back-when (was it 2007?) and when I came across it again the other day, I just couldn't resist. In fact, I found a number of printed patterns (that I had somehow tucked away) and we are offering one free with each kit, as long as our supplies last! 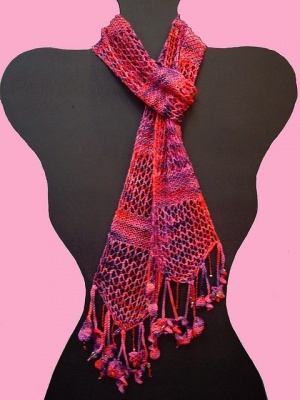 Fun and fast to make, this scarf combines bead knitting with whimsical crocheted and beaded fringe. The lacey beaded rows alternate with stripes of seed stitch and each end tapers to a point. This design by Ellene Warren is just my cup of tea (to make a slight pun on visions of a Garden Party). It is absolutely gorgeous. 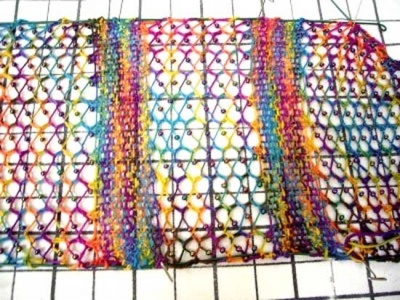 The scarf itself is knitted, with beads on all the mesh sections. 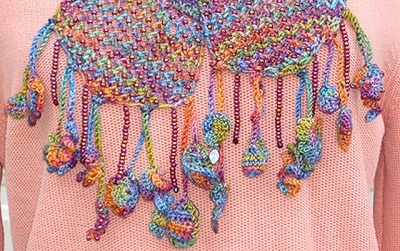 And the fantastic finishing fringes do require some crochet knowledge -- this section is lots of fun, though, and look fabulous. So the design uses quite a few beads -- they are pre-strung on the yarn for the main part of the knitting. They appear on every-other yarn over in the open work sections. 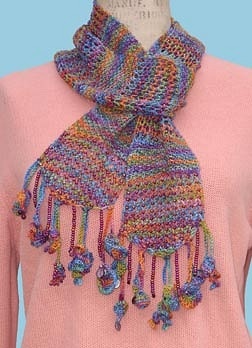 You can easily see them on the last photo on this page, the one of the scarf blocking. Quite dramatic. Once the main knitting is complete, you get to play with a most unusual fringe. 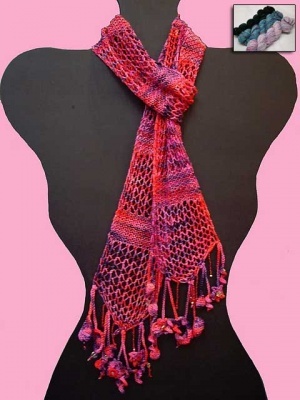 You crochet charming little motifs and space them at the edge, with beads and crystals between, and leaves and other wonderful bead shapes scattered among it all. 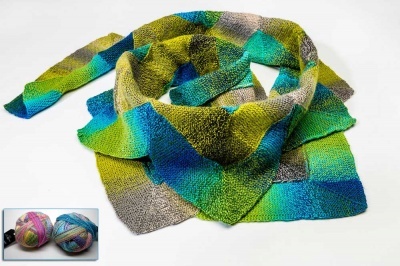 Ellene's original was knit using 2 skeins of Koigu KPPPM yarn and that is what we offer for these kits. Our colorways are different however. 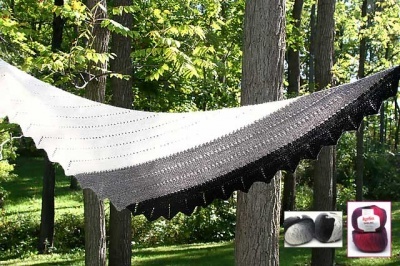 We show our yarn in the inset photo on the upper righthand corner of the top picture on this page and again below it. The other photos are here to show you the design itself. 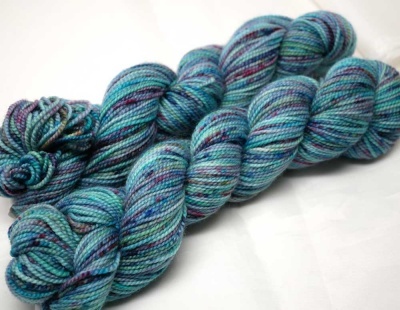 Koigu KPPPM is a handpainted yarn of 100% merino wool, 175 yards (160m) per 50g skein. The yarn is plied and shows stitch work beautifully. 1. #719 is a variegated color, mostly aqua and turquise, with speckles and dots and dashed of other lovely cool hues including deep red-violet and teal and purple and a highlight here and there of chartreuse. A really lovely look. 2. 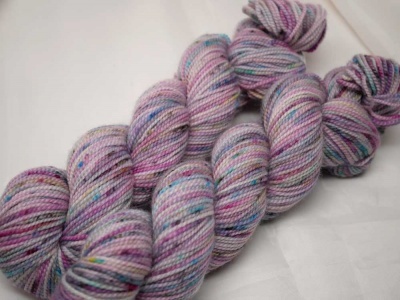 #756 is another speckled variegated colorway. This time the overall look is of pinks and roses, with shots of lilac and blue and speckles of fuchsia and aqua. A gentle feeling. 3. #560 is one of the Fireworks colorways. 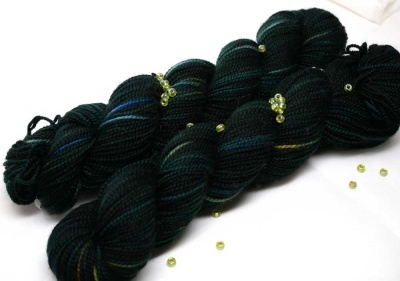 The base is a very dark green, almost black with some lighter green as well and shot rhoguh with teal and aqua and occasional chartreuse. Quite dramatic. For this design, beads are an integral part. With it one needs 1,038 size 6/0 beads (!) -- that is about 85 grams, though we'll include extra just in case. There are quite a few I think will look great --- if you have a definite preference for having the colors either blend a bit or stand out a lot, be sure to let me know. 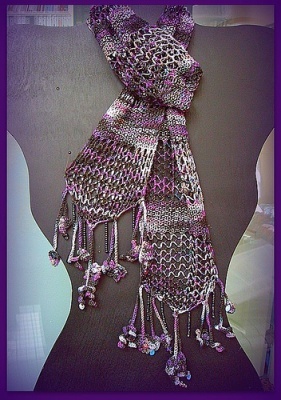 The unique fringe of this scarf uses an intriguing mix of beads as well. Your kit will have at least the needed 10 small crystals, 6 large crystals, 6 leaves and a mix of other shapes and forms to embellish your fringe (Ellene's pattern calls for at least 8 assorted beads). Let me choose colors that look good with your yarn and your 6/0 beads.